No, look, you don't get to make "Honest" reviews unless you can read them in Jon Bailey's voice.I'm sure it's in the rules somewhere. Flavour text:Ow! Right in the meat-and-two-veg! Not really.Normally, the only time I see a lot of "bots" is when I face a mech deck. 02/20/2019 12:35 AMPosted by HappyFeettroll thread -10/10Also necro. 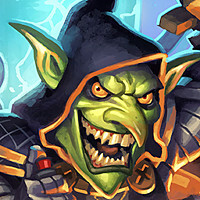 02/18/2019 11:22 AMPosted by SikonChoose your hatred:Midrange meta - no fun curvestone!but i unironically enjoy midrange metasI don't particularòy mind any of them (though I do have a preference for faster matches).My point was merely that any meta you can have will find people decrying it as the "worst meta ever" and "brainless/uninteractive/boring" regardless. Choose your hatred:Fast meta - brainless aggro!Slow meta - snorefest control!OTK meta - uninteractive AFK!Midrange meta - no fun curvestone! 02/16/2019 12:45 PMPosted by HappyFeetFirst was a mage that kept focusing my face health but he had no answer for blood queen lana'thal.That is not OTK. That was aggro/tempo. OTK mage would not care about Blood Queen (beyond it being a big body, and they'd generally have removal for that) since they can just fireball you 5-6 times in a row and call it a day.OTK Mage would also not focus on Face, but more on keeping the board clear and drawing the combo pieces.